July was the month my bedroom walls went from bland to bright. Mr. Karen did all the work–we picked the color together, but he did all the prep and painting. I did take some of the masking tape off, though. Go me. 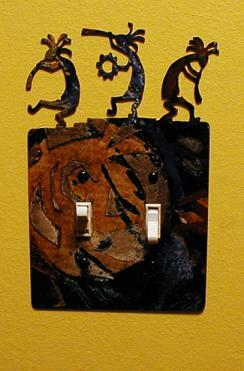 We bought this light switch cover in Taos–it makes me smile. It doesn’t quite go with the purple and yellow color scheme we’re going for in this room, but that’s okay. One year ago, it was just a normal Saturday morning. Two years ago, I was thinking about a new car. Three years ago, I was suffering from holiday stress.